We are kicking off our blog by focusing on some common injuries related to running. Whether you are just beginning a running program or having been running for years, it is important to be as informed as possible on injury prevention due to the high prevalence of injuries in runners. Today, we are going to look at one of the most common sites for pain in runners: the knee. A variety of factors can contribute to knee pain when running, but one of the most common culprits is weak hip muscles. The muscles in your hips work to keep everything in alignment when you run. For example, if your knees come together when you run, indicating possible weakness in the gluteus medius, it can put undue stress on your hips, knees, ankles, and/or feet. Repetitive exercise with weak hip musculature can lead to conditions such as IT band syndrome, patellofemoral pain syndrome, and Achilles tendonitis. An easy way to tell if you are at risk for injury is to pay attention to the position of your knees when running, and see if your knees collapse towards the opposite knee. How can I assess my injury risk for knee pain caused by running? A more formal way of assessing your injury risk is by performing a simple step down test (see below) to determine if your hips are strong enough to maintain proper alignment. To begin, stand on a step, stair, or box with one foot and try to lower your body weight down to the floor. 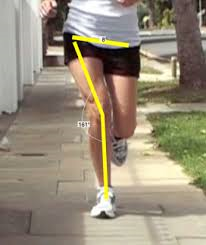 If performed correctly, the knee on the standing leg will not collapse to the middle or move excessively forward (knee surpassing the second toe). If you notice either one of these increased motions during the step down test, it can suggest hip weakness andaltered body mechanics, and place you at an increased risk for injury. What exercises can strengthen my hips and decrease injury risk? These issues mentioned above are often caused by weakness of certain muscles, such as the gluteus medius. Strengthening these specific muscles can help, because having appropriate muscular strength and endurance helps to stabilize your movements. One great beginner exercise for activating the gluteus medius is called the clamshell. This is performed by lying on your non-painful side with the knees and ankles together, and your knees slightly bent. Then, open and close your knees like a clam by lifting your top knee while keeping your ankles together. Perform this exercise while keeping your shoulders, hips, and ankles all in alignment. You should feel this exercise working on the outside of your hip. In the video below, it demonstrates both improper and proper form during the stance test. Pay attention to the standing leg (the leg on the step) and notice on the first repetition (the improper version) how his knee goes towards the opposite knee, with the thigh straying from vertical alignment during the step-down. In contrast, on the second repetition (the proper version), the thigh maintains the vertical alignment and the standing knee does not deviate towards the opposite side.